PSI Horizontal Laminar Airflow System ideal for Microbiological manipulations, work with bio-assays, sterility testing and research work; Vial filling and bunging operations in parenteral units and general dry processing work in semi-conductor manufacture and Tissue culture work. 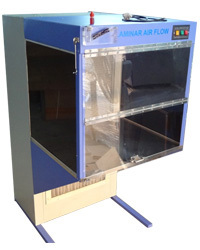 Horizontal Laminar Airflow (unidirectional Airflow) is an confined area moving in a uniform velocity along parallel flow lines. A continuous wash of HEPA/ULPA filtered Air moving horizontally across the work area. The uniform stream of air filtered air moves forward over the work surface from the rear of the work area. The airflow across the work area directly at the user and exhausts into the surrounding area. Application Tissue Culture / Biotechnology / Microbiology etc. MOC Galvanized Iron with Powder coated / Stainless Steel – Satin Finish / Wooden laminated (Except Filters and Motor – Blower Filters). Pre Filter PSI Make Pre Filter with Micro Glass Fibre Media of EU – 4 Rating. Motor Blower Assembly Induction Motor with Centrifugal Blower Statically and Dynamically balanced with Suitable Rating and Size. Working Table S.S. 304 with Due Reinforcement for Better Performance and Stability. Pressure Gauge USA Minihelic Differential Pressure Gauge / PSI Inclined manometer. Lights Fluorescent Tube with Milky White Diffuser. Air Cleanliness Class ISO – 5 (as per ISO – 14644-1).